Tuesday 10 May 2011, Day 168/365. Every year I get a ton or so of wood delivered so I can use my slow combusion wood heater. Unfortunately it cannot get dumped where I’d like to keep it so it has to be moved from the driveway to this spot. I had a bit of help from my son but I moved the bulk of it myself. 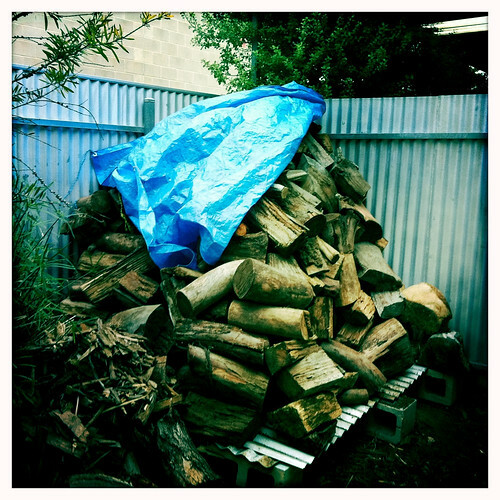 Ten years ago I was eight months pregnant when I got the firewood delivered and I moved it all myself. I know, it was stupid. I can only guess what possessed me to do it myself and not ask for help. Pride? Nesting instinct? I don’t know, but I did it and it didn’t bring on early labour. I’ve added the date I took this picture here because on Flickr photos taken with the iPhone are labelled as being taken when they are uploaded to the website not when they were actually taken. This is a tad annoying.